There are about 1.6 billion mobile broadband connections today. Five years from now, there will be more than three times that many — 5.1 billion — and they’ll be generating a ton of revenue for the companies that provide them. That’s the word from the GSMA, which cited those metrics in the Mobile Economy 2013 report it released this morning as Mobile World Congress kicked off in Barcelona. According to the GSMA, worldwide mobile operator data revenue will exceed that of voice by 2017. And in countries like the U.S. and the U.K. it will do so even more quickly — perhaps as soon as 2014. Argentina’s data revenue will exceed voice this year. Driving that surge in usage: The proliferation of smartphones and tablets, particularly lower-end models. 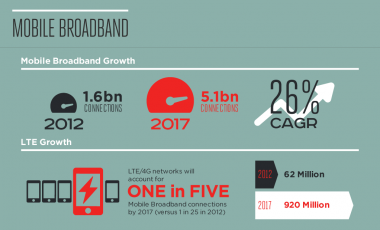 Mobile devices are becoming ubiquitous in developed and emerging markets, and are creating a vast appetite for wireless broadband. And more and more wallets connected to mobile broadband providers.